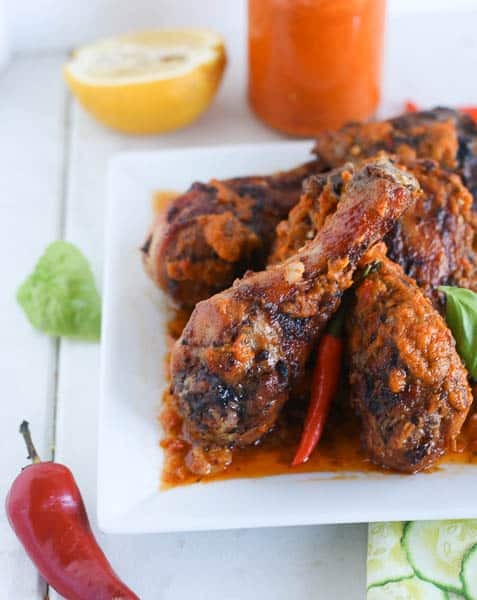 Piri Piri Chicken – mildly spicy luscious chicken legs marinated with the complex flavors of Peri Peri Sauce – a very versatile and bold sauce. Grilling season is here, so it is time to fire up the grill. 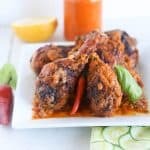 If you are craving something different this summer, here is a great chicken recipe that will get you excited about firing up the grill. You can make it mildly spicy or crank up the heat as much as you want. I won’t judge. Believe it or not, my uncles use to eat these raw chilies with anything he could lay his hands on. No, I did not inherit those genes, thank God. I can only tolerate moderate heat. I have made this recipe mildly spicy because I have a 5year old son and he loves grill chicken. There is no way; I am going tell him not to eat this chicken. He will hate me for life. 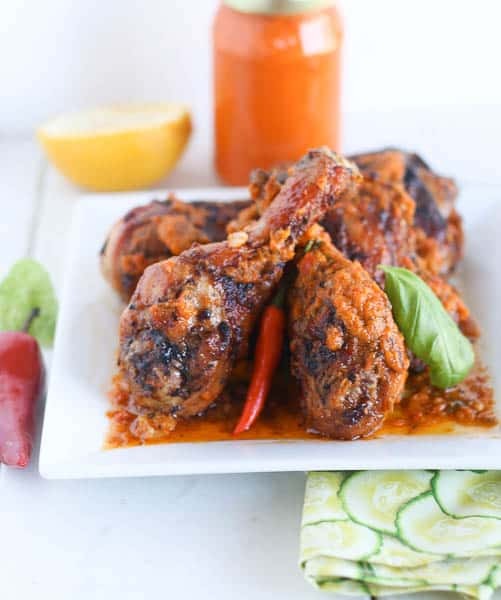 Peri peri sauce is -a blend of chilies, fresh garlic, jalapeno pepper, red pepper, basil, onions oregano, smoked paprika, salt, lemon and olive oil. It is sour, a little sweet and slightly salty- making it a really complex and versatile sauce that you can use on almost anything. Chicken should be a good starting point (legs, thighs, breast) they would do just fine. 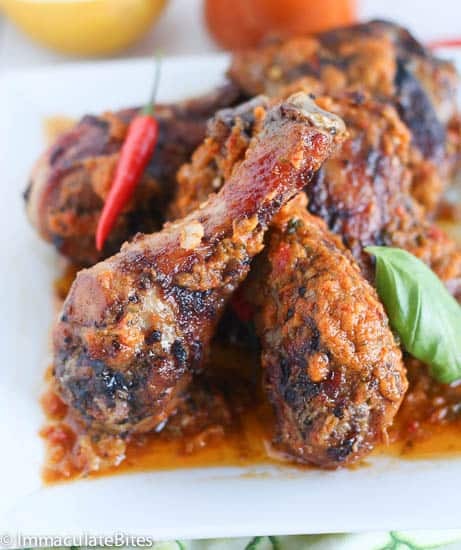 Piri Piri Chicken - mildly spicy luscious chicken legs marinated with the complex flavors of Peri Peri Sauce - a very versatile and bold sauce. Drench the chicken with peri- peri marinate, place in a zip lock bag and refrigerate for at least 2 hours, preferably overnight. In a small saucepan simmer the remaining peri peri marinade and the one from the chicken for about 7 minutes. Serve with chicken or mix with chicken.